I specialize in Occupation Health. Occupation Health is the study of improving living and work environments to improve life/health of workers. The effect of these improvement lasts a lifetime. And ergonomics is a science/technique to change the work environment. In 1976 I participated in physical examination of supermarket register workers and to treat these workers I established Yuwa Clinic with it’s focus on treating occupational disease in the same year. In 1999 I developed a pen for one of my patient’s with tendonitis which became the Dr.Grip ball point pen. Dr. Dr.Grip was first of it’s kind and was a major global success and changed the shape of grips through out the industry. This success led to the establishment in 2001 of our ergonomic focused product research and development company Udoergo. We have developed in cooperation with various companies many ergonomic products including but not limited to the Relief Belt to prevent lower back pain, the Dr.Click to prevent stiff shoulders when working on the computer, the Dr.Chair with it’s automatically moving seating surface to prevent lower back pain, the Dr.Cut to prevent chronic pain when cutting and finally Dr.Move a mattress to help you move while you sleep. Ergonomics is an art and science that we use to create new products to revolutionize the way we work and live. We hope to use these methods to improve working conditions not only in Japan but globally and create a happy society. We look forward to collaborating not only with companies but individuals as well in creating great ergonomic products. Our company is capable of developing ergonomic products. We look forward to hearing from you. Graduated Hiroshima University Medical School becoming a medical doctor. Research subject was on the Study of Occupational Cervicobrachial Failure. Became a guest professor at Kansas State University’s Industrial Design Department to research ergonomics. Became a professor at Hiroshima Women’s University to teach Occupational health and welfare engineering. Become a professor at Hiroshima University Medical School. Became chairman of Japan New Merdian Medicine Society. Focused but not limited to the treatment of occupational disease, asbestos pneumoconiosis and developmental disorders. Consulted and used ergonomic methods to help prevent low back pain at nursing homes, tendonitis of orange pickers and so on. 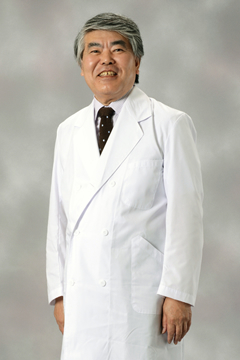 Developed products such as Dr. Grip ball point pen to prevent tendonitis, Relief Belt to prevent lower back pain,Dr.Click to prevent stiff shoulders when working on the computer and other occupational diseases.